TKR6755 – Big Bone Center Driveshaft and Outdrives (Stampede 4×4) – Tekno RC, LLC. 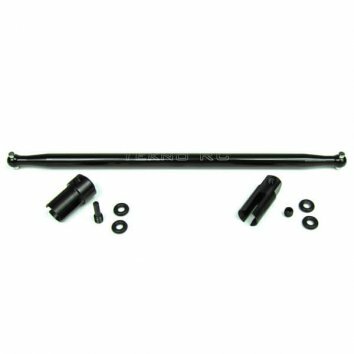 The Tekno RC Big Bone Driveshaft and Outdrives for the Slash 4×4 and Stampede 4×4 solves the many issues associated with the stock center driveline. First off it’s FAT! Yet it’s still extremely lightweight. It’s a dog bone rather than a simple splined shaft and as such will not bind, split, or bend the way the stock shaft does. The laser etched shaft is machined from high quality aluminum and anodized for incredible wear. Newly designed hardened steel outdrives on either end replace the weaker stock parts for the ultimate center driveline available for the Slash 4×4 and Stampede 4×4 vehicles. So yeah, it’s a ‘must have’ for any racer or basher. Another rock solid upgrade from Tekno RC!